The latest chapter in the cowbell controversy: Auburn fans are taking cowbells to Saturday’s game against Mississippi State. Or at least some Auburn fans are. Or at least there are a couple of pictures of Auburn-ed out cowbells being retweeted with exclamation points of varying degrees of endorsement or embarrassment. The noise from the brouhaha, be it real or artificial, has finally reached Starkville, much to the amusement (seemingly) of Mississippi State fans. “The more the merrier,” writes MSU blog For Whom The Cowbell Tolls. Well, turns out they kind of have… but not to get under Mississippi State’s skin. It’s been done at least once (and attempted at least twice) to annoy Auburn. Not fans, not students, not alumni: “The University of Alabama”, full stop–at least according to The Reveille. 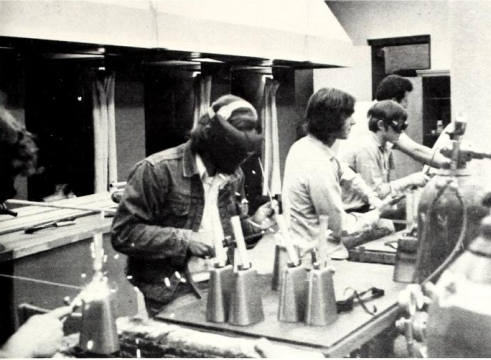 At the time, Mississippi State’s Industrial Education Association was mass-producing customized cowbells that were sold at the MSU student bookstore. It doesn’t appear as if the deal went down, or at least Auburn quarterback Phil Gargis doesn’t remember cowbells being at that year’s Iron Bowl (which inspired a rule change of its own) like he remembers them (ever so well) being at Auburn’s game against the Bulldogs. He does, however, remember them being at Gator Bowl that year. Is he imagining it? “To the delight of a strong Auburn following and to the dismay of Texas’ cowbell-carrying fans, the Tigers held a 16-3 halftime lead over the touchdown-favored Longhorns,” the Auburn Plainsman wrote in its story on the game. Auburn wound up trouncing Texas, 27-3. “I think they threw the cowbells away after the first quarter,” Gargis joked. Gargis said the bells were mostly rung during pregame activities.